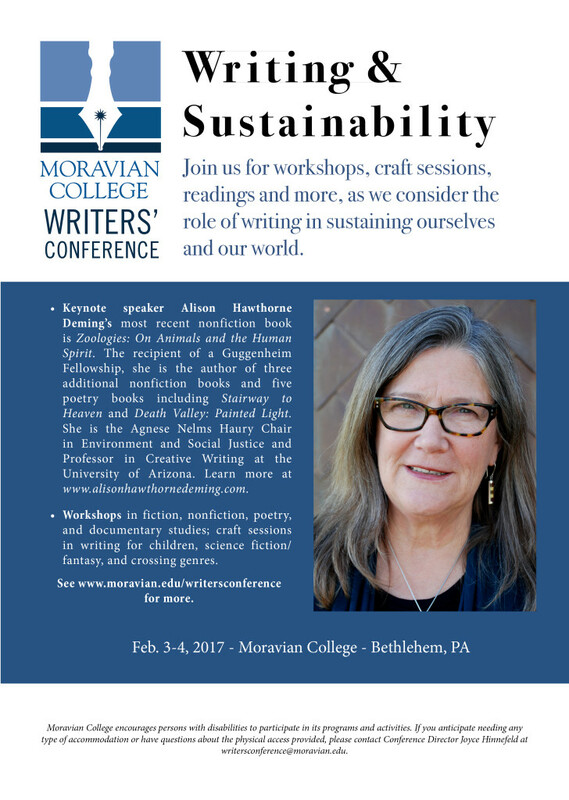 I am so excited to announce that I will be a workshop presenter at the Moravian College Writers’ Conference, February 3-4, 2017. Please mark your calendars to join me and other talented writers for an inspiring day of literary art! Writers often begin their careers as something other than writers, and in the sub-genre of environmental literature, the pedigree of writers often includes a scientific background. Yet the scope of sustainability issues we face is challenging beyond a technical level, demanding that we seek other outlets to comprehend and communicate not only what we know as scientists, but what we feel as parents, teachers, and citizens of the world. Panelists will discuss their evolution from professional scientists and researchers into writer-scientists, and how traversing disciplinary boundaries has enriched both their personal and professional lives. Topic areas to be covered will include using creative writing to metabolize and understand the life questions that science has uncovered, employing scientific research skills to inform our creative work, and using creative strategies to advocate our scientific understanding of important sustainability issues.